Did the warm weather make anybody else start craving a good ol’ BBQ? Well it made me brush off the snow from the ‘Que and start looking for some delicious lean protein sources. I found one recipe that looks awesome from allrecipes.com if you remove the cheese from it you’re looking at a great protein source. In a large shallow baking dish, mix the yogurt, feta cheese, lemon zest, lemon juice, oregano, salt, pepper, and rosemary. Place the chicken in the dish, and turn to coat. Cover, and marinate 3 hours in the refrigerator. 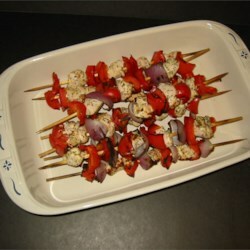 Thread the chicken, onion wedges, and green bell pepper pieces alternately onto skewers. Discard remaining yogurt mixture. Grill skewers on the prepared grill until the chicken is no longer pink and juices run clear.